Tiger Tours India. If you are looking for a tiger tour, for viewing or photographing tigers, but one that is not crowded and also takes care of the professional needs of wildlife lovers and photographers, then we have a wide range of tiger tours just for you. We also have family tours where you can bring your family along while you still do serious photography. Being a photographer with family & kids, we know needs of a family while still maintaining the high levels of photography on tour. Our Tours are in the best parks, known for frequent tiger sightings and we choose the best zones of the park for safari. We use the best drivers and trackers wherever allowed by the forest dept rules. Our tiger tours are also accompanied by a wildlife photographer, who knows the park and helps in getting the best opportunities for tiger photography. All this and many other small details based on ground information and tiger movement give guest on our tours a very high chance of seeing and photographing the tiger. You can see our tigers photography. Below are some of the best tiger tours we offer. 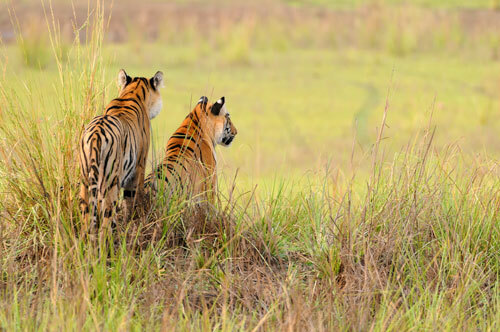 Focus on Tigers at Bandhavgarh and Ranthambore for 12 days and 11 nights. As the name suggests this tour is focused on tigers, whether you want to see or photograph them. Bandhavgarh and Tadoba Tiger Photography Tour for 12 days and 11 nights. Tiger sightings are quite frequent in both the parks. Ultimate blend to view tigers in the wild. Ranthambore Tiger Photography Tour for 6 days & 5 nights. The ancient relics of the past make its landscape unique. The best place you can witness tigers living in ancient ruins. Bandhavgarh and Kanha Wildlife Photography Tour for 11 days and 10 nights. Tigers and Barasingha are the main focus. Expect to see the maximum variety of animals. Bandhavgarh Tiger Photography Tour for 6 days and 5 nights. One of the few places where you can still expect to see a tiger at close distance. Tadoba Tiger Photography tour for 6 days and 5 nights. Tadoba Andhari tiger reserve (TATR) also known as the Jewel of Vidarbha. Highly recommended for Tigers. Corbett Jungle Stay & Photography tour for 7 days and 6 nights. Staying inside India’s most picturesque & pristine jungle is rewarding. A Dream come true. Whether you are traveling alone or with family and friends. A photographer or just a nature lover. If you are looking for a great wildlife vacation contact us for a tour you will want to do again.